Established over a decade ago, STS Engineering Solutions (STSES) provides Liaison and Project Engineering support to the aviation industry. To understand these services, it is important to define the principles and parameters in which we are regulated by the FAA. Certification: According to their size (weight), fixed-wing aircraft (airplanes) are design and certified via FARs (Federal Aviation Regulations) Part 23 and 25. Rotorcraft aircraft (helicopters) are designed and certified via FARs 27 and 29. TC (Type Certification): An aircraft receives a “TC” from the FAA when all parameters of an applicable design Part (23, 25, 27, or 29) has been met along with ground and flight testing. STC (Supplemental Type Certification): A Major Alteration to an aircraft and/or fleet requiring FAA approval. 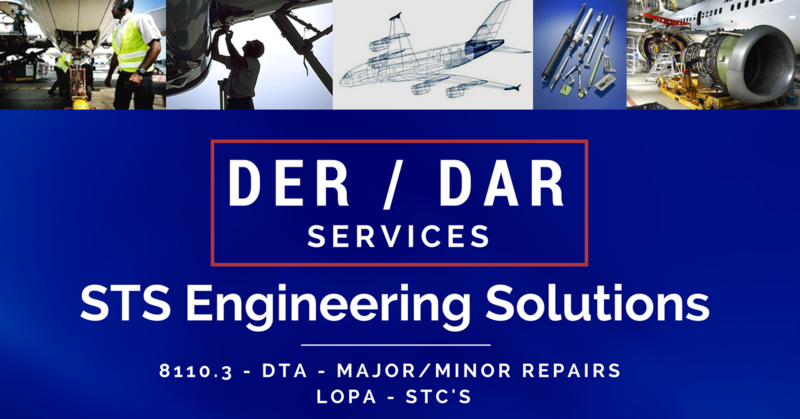 DER (Designated Engineering Representative): With an Engineering degree and minimum (8) years aviation engineering experience, an individual may apply to the FAA for DER authority. Once awarded, a DER is given explicit authority based on their qualifications (Structures, Electrical/Avionics, Systems, Power Plant, Interiors, Composite, DTA (Damage Tolerance Analysis), etc.) as detailed in FAA DER manual 8110.37 (E). DER authority allows this individual, as an extension of the FAA), to review and approve repair and design data via the completion of the 8110-3 form. This status/authority must be renewed on a yearly basis. Static DER Approval: DER approval for aircraft structure based on the applicable FARs during ultimate loading conditions. DTA DER Approval: DER approval for aircraft structure based on fatigue analysis derived by cyclic loading to conservatively predict structural failure by means of crack growth propagation. ODA (Organization Delegation Authority): Special FAA authority for an engineering organization/company to approve STCs in lieu of the FAA. Major Repairs: Whereas the industry has several definitions, STSES supports FAR 43 Appendix A in which Major Repair is defined as “…strengthening, reinforcing, splicing, and manufacturing of primary structural members or their replacement, when replacement is by fabrication such as riveting or welding, are airframe major repairs”. Minor Repairs: Repairs to secondary structure and/or rework to primary structure in which strength restoration is not required. Major/Minor Logic Tree: As part of an operator’s (typically 121 or 135) procedural manuals, an FAA-approved matrix must be followed which classifies repairs to the aircraft. Approved Data: Data ultimately approved by the FAA and/or designee to substantiate and approve Major Repairs (i.e. : FAA direct approval, DER 8110-3, STC, Service Bulletins (S.B.s), ODA, OEM (Original Equipment Manufacturer), SRMs (Structural Repair Manuals), etc.). Acceptable Data: Data used to substantiate and approve Minor Repairs (i.e. : OEM letters/telexes, MMPDS (FAA Materials Property Handbook), test data, fleet history, MIL-HDBK-5 (Military Design Handbook), etc.). As you can see, engineering support in the aviation industry is quite complex and highly regulated. Let STS Engineering Solutions be your 24/7 cost-effective choice for engineering support. Request a quote today!